That being said, what I do have a vested interest in are these characters—with whom I really do feel I’ve spent a lot more time that just four episodes (possibly due to the weekly posts and the elongated watched schedule, but whatever). I’ve got my pet peeves about Oreki and delight in seeing him get tormented by his friends and by the situations in which he finds himself. I’ve come to really love Ibara, her causally easy friendliness with Chitanda, and the clear effort she’s making to keep up with a trio of really intelligent people. 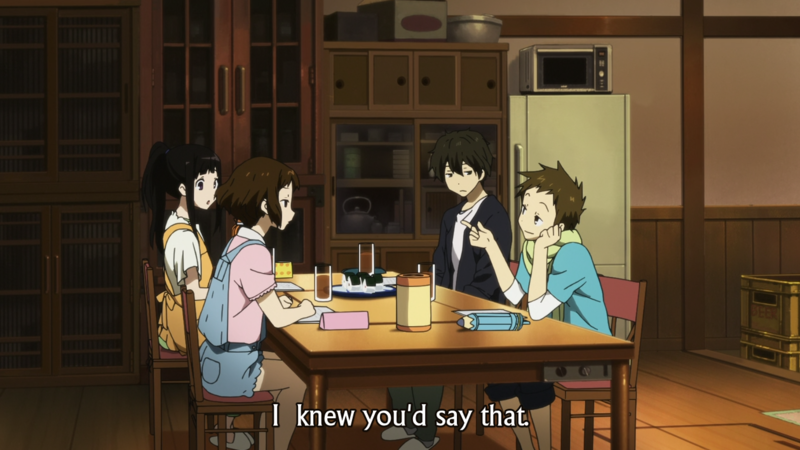 I’m kind of fascinated by Satoshi’s increasingly obvious passive-aggressive behavior towards Oreki, and I’m charmed by the sincerity with which Chitanda approaches every situation. 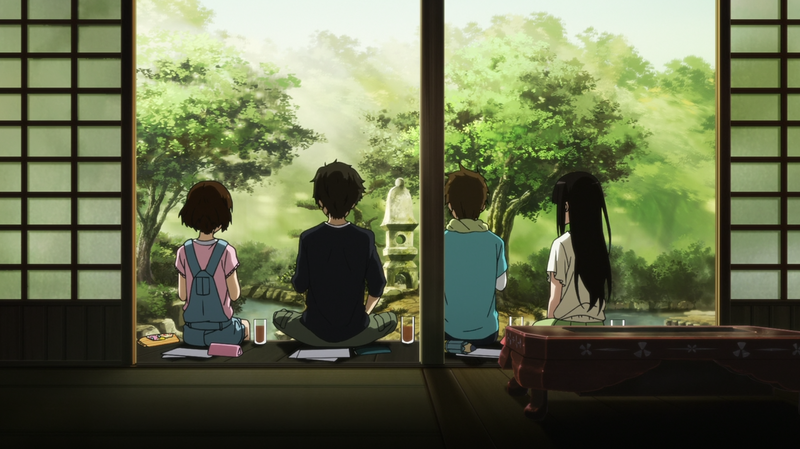 These are a good group of characters, and watching them together is a lot of fun—despite Oreki’s constant attempts to rain on the parade. 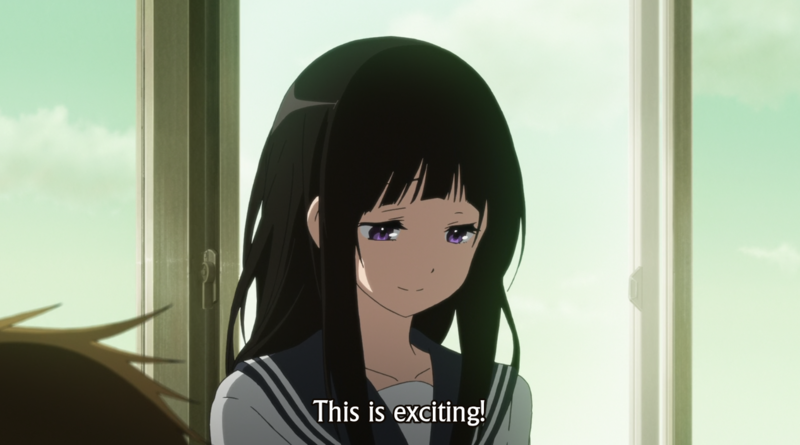 Although I wouldn’t really say Hyouka does character highlight episodes in the way, say, a harem anime will spotlight one girl for an episode to fill out her character, this episode was about as close as you could get to that on Hyouka terms—and the focus this week was on Satoshi. I was warned early on that Satoshi might, in fact, be the most complex member of the cast, and after this week I’m inclined to agree. 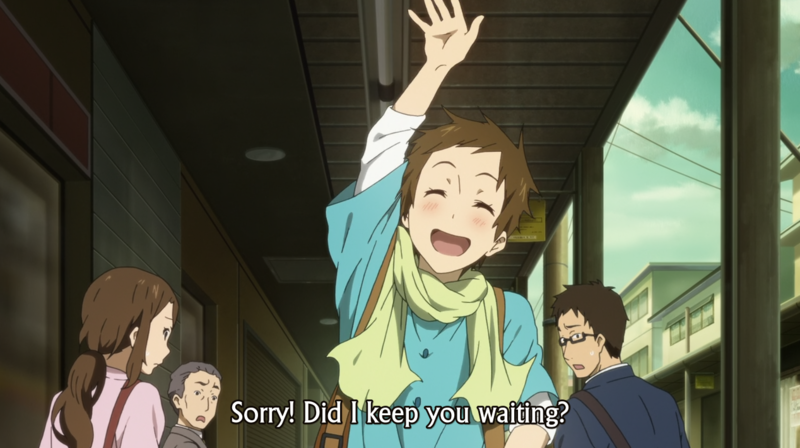 Despite his superficial genki personality—a character type common neither for anime males of Kyoto Animation leads—it seems pretty obvious that a great deal of Satoshi’s hand-waving and excitability is manufactured. I don’t mean to say that it’s inauthentic or fake. Satoshi may indeed be putting on airs, but it seems to me that he does it because he wants to and finds it fun. 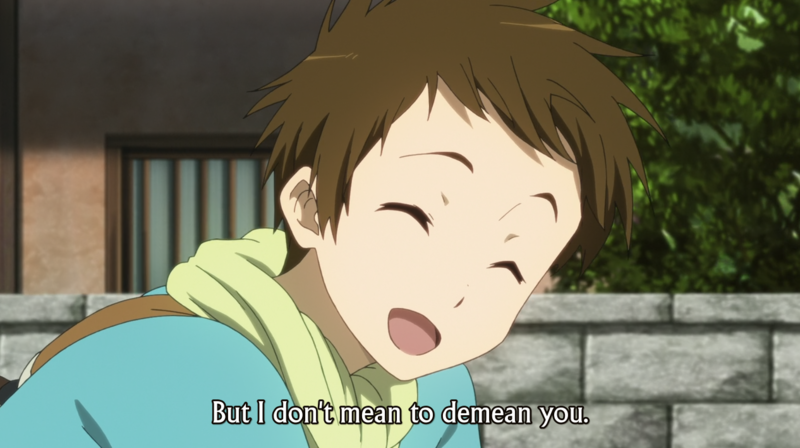 This is one case, though, where I can’t entirely blame Oreki. Satoshi’s clearly got a problem with his fluffy-haired acquaintance (it seems a bit incorrect to call them friends), as his passive-aggressive jabs and frequent actions taken seemingly to specifically annoy Oreki demonstrate—but it also doesn’t seem like Satoshi’s ever taken the time to spell out for Oreki why he acts the way he does or that Oreki bothers him. But we’re still just in the opening moments of this show, so we’ll see if things get worse or better from here on. This may be the place Chitanda lives, but it is certainly not a “home” in the sentimental sense of the word. When the camera wasn’t busy flicking through the reactions of the group to each other (almost as if they’re continually sizing each other up), it spent a number of shots establishing just how big this structure is. It’s a rather obvious point, but it bears mentioning that we don’t see even a suggestion of other people besides Chitanda being here. It’s an empty, lonely space, as show by the isolating long shots in the gallery above. People are confined to small areas of the frame—the negative space of the house’s vastness takes up the rest. 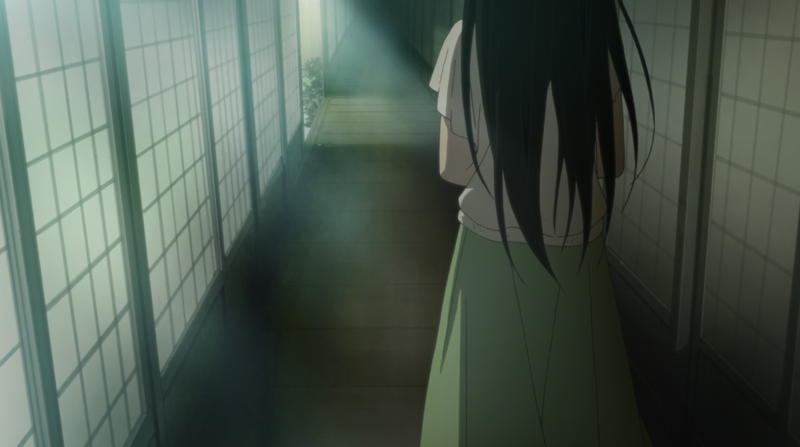 It’s less evident when there are other people around her because of the physicality of the staging, but Chitanda is alone, trapped within the restrictive openness around her. 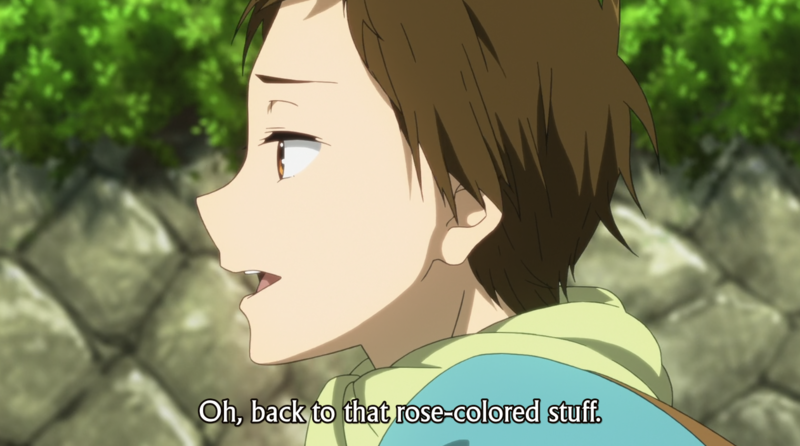 I suspect this will eventually play into a larger part of her character arc, but (again) we’re still just in the beginning stages of this journey—no need for Hyouka to spill all the marbles yet. You may notice this is showing up on a Sunday, not a Saturday. I apologize for the delay, but this is going to be the new weekly home for these posts. I’m hoping to add an editorial-style piece to my output every Friday, so pushing Hyouka back a day gives me a bit more room to work with and space out my update a little bit better. It’s all for more content! I don’t need to make a big deal out of this again, as it seems to be on its way to becoming matter of course, but once again this week the pre-OP segment was a really effective choice of events to incorporate Ibara and Satoshi into the search while keeping that necessary event encapsulated within the smaller block of time. Good stuff. Might sound a bit sad but, they aren’t exactly the best of friends, are they? Is Ibara staying over Chitanda’s place? We didn’t see her leaving the house, or entering, too, actually. And yes, that was something I was wondering about, too! I definitely like the idea of Ibara staying over at Chii-chan’s, but at this point in their friendship I’m not really seeing it happen yet? 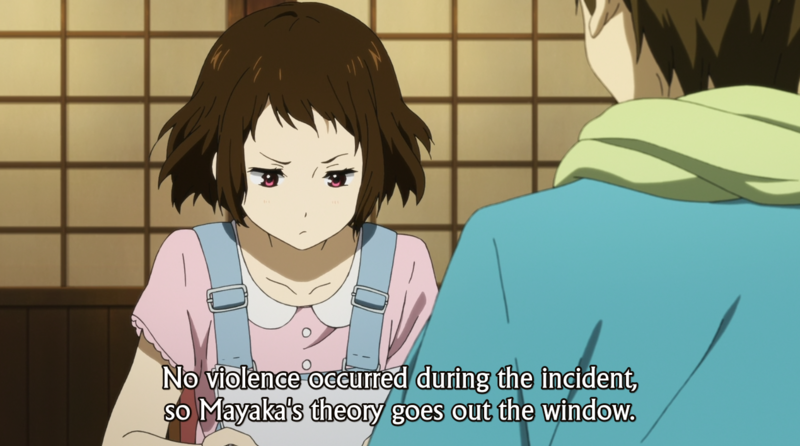 I’m not expert on Japanese culture, but it seems to me that Hyouka is one of the shows, where you’ll get more out of watching it if you become aware of your western bias and suspend it a bit. Houtaro and Satoshi say things to each other they’d never say to acquaintances (shiriai hito). But at the same time, it’s clear that they’re holding back. They don’t bare their hearts to each other, so you’re right: they’re not best friends (shinyuu). I’m fairly sure they’ve identified each other as childhoodfriends (osananajimi) in the first episode (but I might misremember). That’s a lot like siblings, but with more opportunity to distance yourselves from each other. I think their behaviour makes a lot of sense when viewed like that. Your point is well taken, although I think from my perspective it’s just a limitation of language and the difficulty of translation. I basically understand their relationship in the way you’re describing—”acquaintances” is just closest approximation I can give in English. As always, great writeup, Bless. 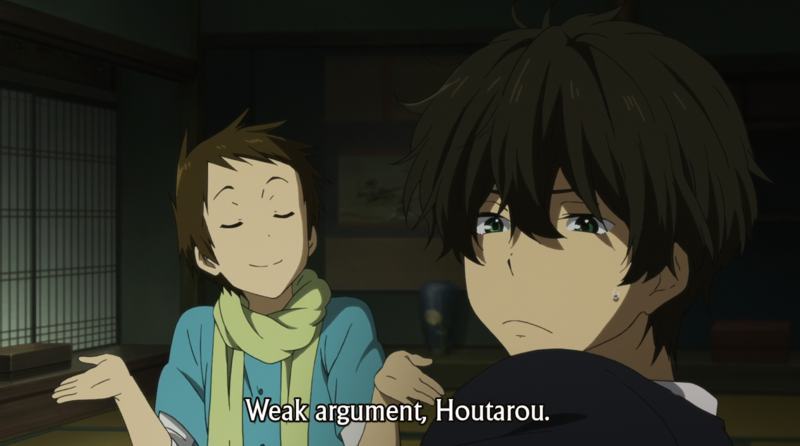 Reading these makes me want to re-watch Hyouka with you. If you think tensions are running high now, just wait until the story arcs starting at around episode 8. 0_0 I suppose that in all fairness, I do remember things sometimes being like that as a teen – the smallest things could feel intensely dramatic and on some days, absolutely /everything mattered, to an almost laughable degree. 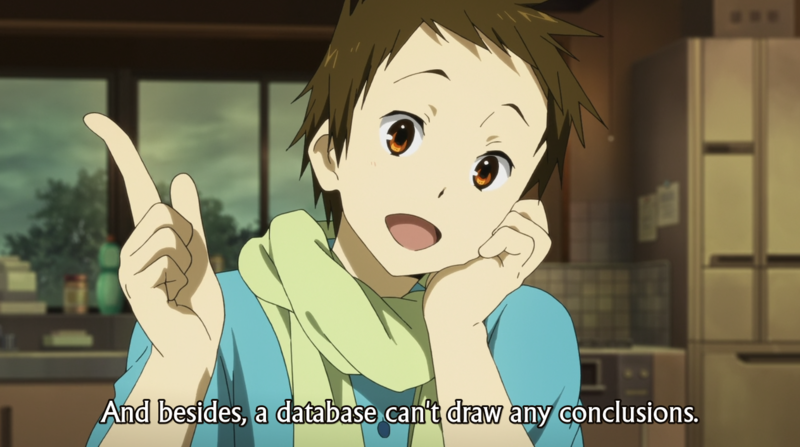 On another note, this post reminded me of another reason why I love Hyouka so much, and that would be the characters as a group. 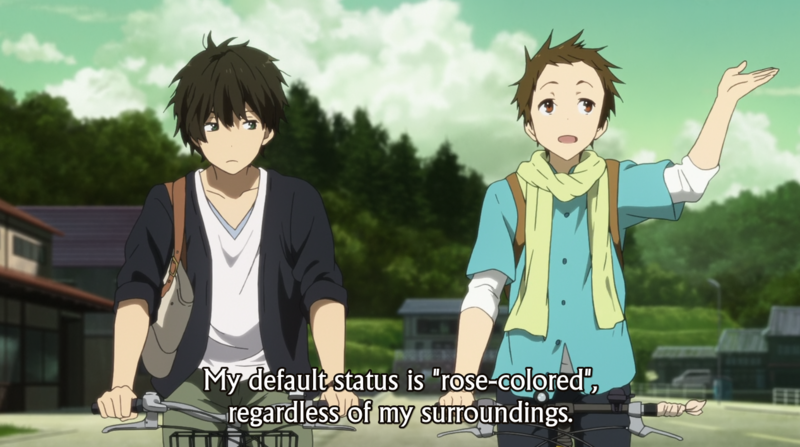 Normally when I watch an anime, there’s at least one character among the main cast that I either dislike or think is basically unnecessary to the overall story, but in Hyouka’s case, I feel like everyone belongs exactly where they are. 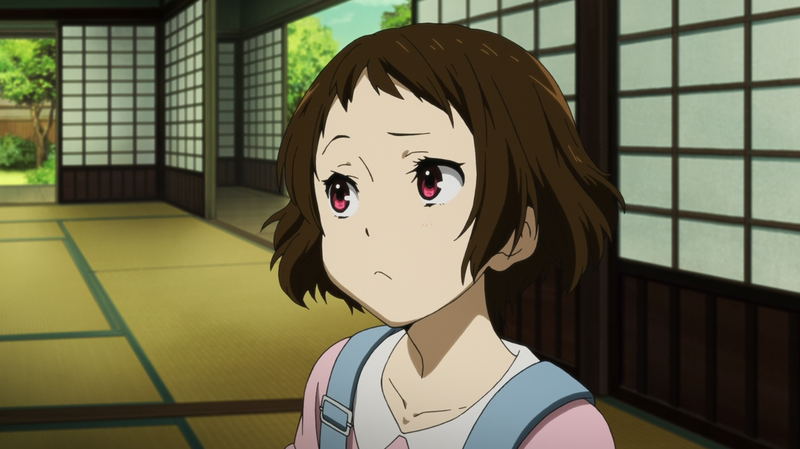 It’s not quite that I personally love every character, but by the end of the show I had come to feel that Hyouka would have been a much lesser show were any one of them missing. 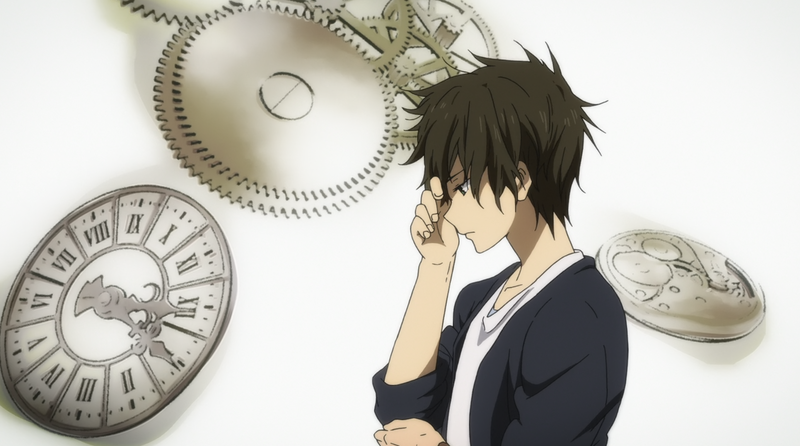 For instance, I really strongly relate to Oreki. I know what it’s like to be that person stuck in a grey life who secretly wishes for a colorful life while also actively resisting any sort of change. It’s a miserable place to be. I wish I had had a Chitanda, whom I like quite a lot also. While she fulfills the role of the “manic pixie dream girl” as we call it over here, I feel there’s a lot more to her than that. As you say, she’s alone and outside and I hope to see her get her own development arc. Satoshi hasn’t impressed me yet. He just feels a bit manipulative and I have a strong aversion to manipulative characters. Also, I really like the mystery aspect of the episodes. I think the show would be much too boring without that kind of thing to use as a lens to focus on the characters through. We can learn more about them by seeing how they think about and react to the mysteries they encounter. I mean, I like character development as much as the next person. But I prefer there to be plot as well. And I really enjoyed their speculations on Sekitani Jun (and yes, awesome name!). I thought the mystery itself was very interesting, but I tend to enjoy mysteries in general, especially when they aren’t crime-related. Looking forward to watching more and reading your analysis!